More Than 300 Chemical Attacks Launched During Syrian Civil War, Study Says Researchers say this number could be much higher, and that Syrian President Bashar Assad's regime carried out 98 percent of them, dropping chlorine gas, sarin and sulfur mustard gas on civilians. A man walks amid rubble in the Syrian town of Douma in April 2018. A report out Sunday confirmed that a chemical attack early that month was one of hundreds since the start of the Syrian civil war. That's a number higher than previously known — and "we suspect that the real number may still be significantly higher," they write. The researchers pored over reports of chemical attacks going back to 2012, reviewing the available information on each to verify the details. They collected evidence from "Syrian and international non-governmental organizations, monitoring groups, private firms, local administrative bodies, relevant international bodies, local and international media, and the open source." The report's authors attributed 2 percent of the chemical weapons attacks in Syria to the Islamic State. Syrian President Bashar Assad's regime carried out 98 percent of them, according to the authors, dropping chlorine gas, sarin and sulfur mustard gas on Syrian civilians. 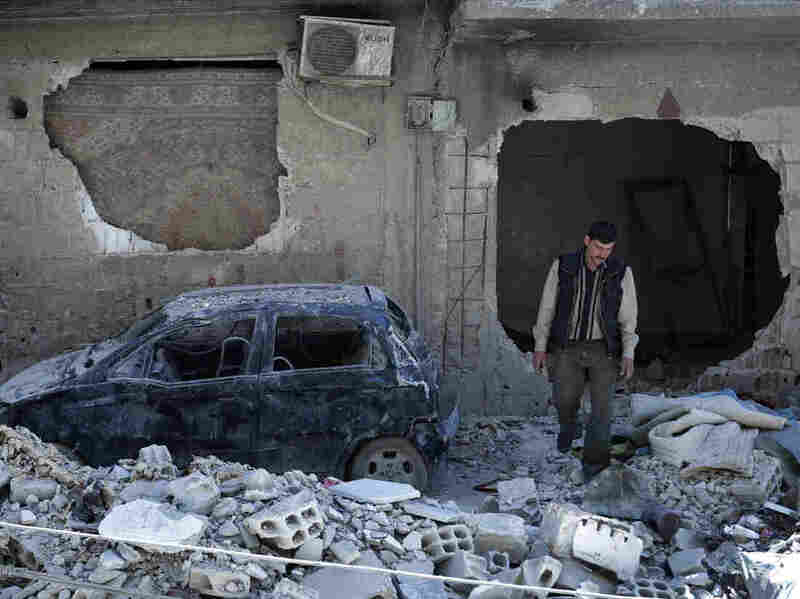 "It is clear that the Syrian military has consistently prioritized striking population centers over rebel positions on the frontlines, even in the face of defeat on the ground," they write. Most of these chemical attacks, the report concludes, came after August 2013, when a sarin attack outside Damascus left more than 1,400 people dead. President Obama said then that the U.S. would take military action against Syria, with congressional approval. Instead, the U.S. entered talks with Russia and formed a resolution calling for Syria to get rid of its chemical weapons. A year later, the U.S. announced that Syria's chemical weapons had been destroyed. But chlorine wasn't part of the deal. As NPR's David Welna has reported, "Unlike other substances that fall under the treaty, such as sarin and mustard gas, chlorine is also produced and used in Syria for peaceful purposes, from cleaning products to water purification." Still, the State Department said in 2014 that chlorine attacks would violate the Chemical Weapons Convention, which bans the use of chemical weapons in war and which Syria has signed. Researchers at the Global Public Policy Institute found that the vast majority of the attacks since 2012 — 91.5 percent — have been chlorine bombs. Their report comes just a month after the U.S. began withdrawing from Syria. President Trump announced via tweet in December, "After historic victories against ISIS, it's time to bring our great young people home!" As NPR's Tim Mak reported, the U.S. withdrawal from Syria "was news to American diplomats, military officers and lawmakers, who raised concerns that ISIS had not yet been defeated and that the withdrawal would leave U.S. allies in the lurch." Secretary of Defense James Mattis announced his resignation the day after the announcement to withdraw troops. Days later, Brett McGurk followed. He was the U.S. envoy to the coalition fighting the Islamic State.